I've always had a thing for the double breasted dinner jacket. I first saw it at a New Year's Eve party held at my college during freshman Winter break. There was no rule against students attending but pricey tickets and the fact that most students were home for the holidays certainly helped keep many away. My date, president of the SGA, and I got the distinct feeling many of the faculty (who were there gratis) wished we were someplace else. My art professor was a little kooky and consequently he and his beautiful German wife hung out with us. In a sea of single breasted dinner jackets -- he alone-- was elegantly clad in the most beautiful double breasted dinner jacket matched only by a tartan dinner coat worn by a very preppy architect. It was a vintage double breasted dinner jacket he found from the 30's and it looked it. 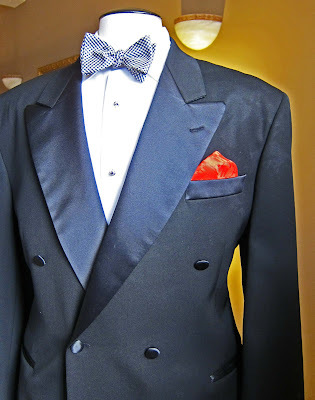 Rather than the cloth covered buttons so common on American evening wear - - his were larger and plain black with a beautiful shine. It looked bespoke and I didn't know what bespoke was. This double breasted coat is far from bespoke. I bought it some place off the Edens north of Chicago for $99 and am proud to say it still fits. Made in the USA and I'm pretty sure in Chicago. It has pocket flaps which are a big no-no so I tuck the flap in the pocket and voila, double bessom. My only regret is it's ventless but what do want for a hundred bucks. Here's a tip that took me a while to figure out. Studs, especially those with the annoying push in stalks, are best placed in the shirt before you put it on. Leave the top stud near the neck out and pull the shirt on over your head. Then you only have to deal with the one by your neck. And one other thing. Get dressed early. You'll need an extra hour at least. Most of it will be spent on the studs. I've mentioned my disdain for pocket squares before. And I continue to buy them. Why, I don't know. But this Hermes pocket square works. 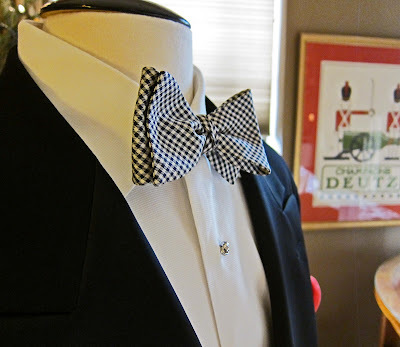 The studs pair nicely with the bow tie and for the most part it's a simple and inexpensive approach. Although, now that I think of it...the pocket square did cost more than the tuxedo. the combination of the bow-tie and jacket is great, i cant wait to have an excuse to buy a dinner suit. to be honest though, this preppy architect would probably find himself more inclined towards the tartan jacket as well. merry christmas! I have a silly fixation on shawl collared DB dinner jackets. Yours is lovely though, and especially the b/w tie. Beautiful smoking jackets......one of my favorite items? Just curious, you mentioned you could still wear the DB, and that made me believe you might not be able to wear the plaid or black velvet jackets. I hope this is not true because those are great jackets. Especially the plaid jacket, it is my favorite. 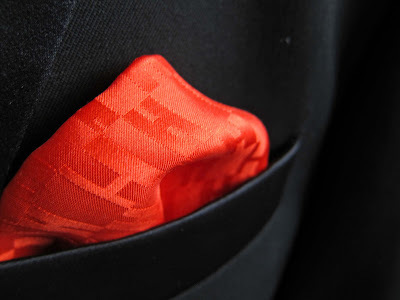 Out of everything here, my eye rested on the beautiful H of the pocket square. Divine. I love them - a little detail that shows a male cares (about little details). I'm fortunate to own two vintage DB DJ's (my father's and Mrs. E.'s grandfather's). Ventless is traditional and I bet it looks great on you. Think I'll forgo my MTM DJ this year and go for one of the DB's. But at 14 oz. roughly, I'll have to stand by the door all evening. brandon- Merry Christmas to you. I recommend, since you're in the Phila area, that you try the Junior League Thirft shop in Ardmore. It's amazing and you just may find a tartan DJ. Toad! Nice to hear from you. I covet the shawl DB as well but afraid that's moved onto the land of bespoke. A pity. Someone like Press should knock one out. With flat front trousers. Richard- The Herzfeld is a little tight. Ok, it's a lot tight. It's a medium. The Velvet DJ is Purple Ralph and it's a 44R. Also a little tight. When I wear them I try not to eat. Alice- Your Hermes obsession knows no bounds. Chris- 14 oz? Man, that sounds like something off the Row. The drape has got to be amazing. Perfect for Christmas carols at the Lincoln Park Zoo. ME- Settle down. That's a form and not a man. One out of Louisiana and the other from NYC (I believe, but it is bespoke.) Drape? I understand the term, but "drape" sounds wrong for the ramrod straight way they hang. the are the stuff of movie stars from the golden age. Mrs. E.'s grandfather's have flat front trousers, too. Oddly, both have belt loops. Excellent rig. I'm with Toad...I'd like to have a DB shawl but don't do the formal thing enough anymore to warrant one. thanks for the tip tintin, the thrift stores in the city are filled with the usual crap. The db peak lapel model looks great. Agree also on the Ardmore thrift shop-the Main Line is a great Trad destination. I've got a peak lapel tux that was my grandfather's. The pants are about 1/4 inch too short, but I've been far too lazy to get them fixed. Polo does a great DB tux - heafty, grossgrain, double vented. Probably near two grand now but hey, they do go on pseudo sale. The tie with the velvet jacket is superb. Wrong comment thread, I know. .....The DB definitely takes the prize in black or ivory......personally I prefer the peaked lapel but shawl looks very good too. A salesman once told me that double-breasted jackets originally weren't supposed to have vents. Actually, I don't know that I've ever run into a DB that had vents.